The first honor under the microscope is the Jack Adams Award, being vied for by three first-time finalists -- Joe Sacco of Colorado, Dave Tippett of Phoenix, and Barry Trotz of Nashville. The Jack Adams Award is presented annually by the National Hockey League Broadcasters' Association to "the NHL coach adjudged to have contributed the most to his team's success." The winner is selected by a poll among members of the NHL Broadcasters' Association at the end of the regular season. Joe who? More than a few skeptics asked that very question on June 4, 2009 when Colorado named a journeyman former NHLer to the post of head coach, following such luminaries as Marc Crawford, Bob Hartley, Joel Quenneville and Tony Granato. Call him "Super" Joe now (all due respect to Joe Sakic). Sacco more than restored pride to one of the NHL's marquee franchises that suffered a disappointing fall from grace in 2008-09, out of the playoffs and 28th overall in the League. Sacco, 41, displayed his mark on his youthful squad early on, guiding the Avalanche to a 10-1-2 start, tying him for the second-best record through the first 13 games as a head coach in NHL history. For much of the season, Colorado battled Vancouver and Calgary for the Northwest Division lead, eventually placing second and capturing the No. 8 seed in the Western Conference. The Avalanche finished 43-30-9 for 95 points. The Avalanche became the first Western Conference team to make the playoffs after finishing last in the conference the previous year since the current alignment was introduced in 2000-01. Furthermore, Colorado's 26-point gain over its total from 2008-09 (69 to 95) was second in the League, two points behind Phoenix. Folks, this is no small accomplishment. Colorado's roster is so young -- they dressed 10 rookies, including two 18-year-olds on opening night -- the training staff hardly needed to supply razor blades in the locker room. Also consider that Sacco guided a team in the first full season of Sakic's retirement -- that's like washing windows on a high-rise without a safety belt. In 2008-09, Colorado had a minus-58 goal differential. Sacco, who previously coached Colorado's AHL affiliate for two seasons, led a turnaround that produced a plus-11 goal differential and a home record of 24-14-3 at Pepsi Center, not to mention a winning road mark (19-16-6). The Avalanche also increased their power play (18.1 percent) and penalty killing (80.2 percent) success rates over 2008-09. Let's face it ... this is a no-brainer. Hired by the Phoenix Coyotes roughly halfway through training camp, Tippett provided stability to a franchise that was anything but stable prior to Sept. 24, 2009. "You have to weigh the situation," Tippett said when asked about the club's ownership issues. "But in the end, the intrigue of building a good hockey team outweighs all the off-ice stuff. "What happens off the ice, we have no control over. We have control over what happens on the ice." Picked by many prognosticators to finish near the bottom of the Western Conference, Tippett and the Coyotes racked up 107 points during the regular season. They finished fourth in a conference that saw the top seven clubs garner 100 points or more. Not bad for a team that finished 13th just a season earlier -- and one that hadn't reached the Stanley Cup Playoffs since 2002. The 28-point improvement from 2008-09 was the highest in the NHL. The numbers speak for themselves. 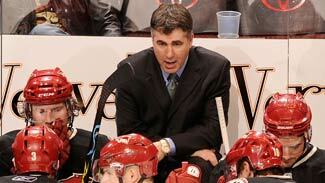 Tippett's Coyotes were one of only four teams to win 50 games and have a winning percentage of .650 or higher. With the help of some stellar goaltending from Ilya Bryzgalov, their penalty killing ranked sixth at 84.5 percent and the 2.39 goals allowed per game was the third lowest in the NHL. When the Coyotes had the lead, they held on to it. Phoenix won 33 of 35 games when leading after two periods. And with clutch players such as Adrian Aucoin on board, the Coyotes went 19-7 in games that went to overtime or the shootout. Their season ended prematurely when they lost a Game 7 on home ice to the Detroit Red Wings in the opening round of the playoffs. But the fact remains that Tippett provided hope to a franchise that so desperately needed it last September. "This is a very special group of players," Tippett said after that loss. "The camaraderie and the way these guys interact, it's very rare. There's a lot of things that really went very well for this group this year. It's a good foundation." It starts with the coach, who is primed to be recognized for his efforts in Las Vegas next week. Nashville coach Barry Trotz has again done enough to have his name etched on the same trophy as Scotty Bowman, Al Arbour, Pat Quinn, Jacques Demers and Pat Burns. It's time for it to finally happen. Working for an organization that manages its payroll with a delicate touch, Trotz masterfully guided the Predators back to the Stanley Cup Playoffs this season when they probably -- at least on paper -- had no business being there at all. Nashville finished the regular season seventh in the Western Conference with 100 points, a number that would have been good enough for fifth in the East. They won 47 games, fifth most in the West, and two more in the playoffs before falling in six games to the now-celebrating Chicago Blackhawks. The Predators had seven more wins and 12 more points than they did last season despite having a similar looking roster. Nashville doesn't have the same star power or offensive punch as a lot of its high-end competitors in the Western Conference, but that didn't stifle the Preds one bit. Under Trotz, Shea Weber has blossomed into one of the game's best defenseman, and Patric Hornqvist has developed into a 30-goal scorer and a plus-18 player. Pekka Rinne has become a true No. 1 goalie with stats such as 32 wins, a 2.53 goals-against average, .911 save percentage and seven shutouts. But statistics don't define Trotz's success. Steve Sullivan and Hornqvist, who each had 51 points, were the closest players the Preds had to point-per-game guys, yet their offense was still good enough to get into the playoffs. Each of the other 29 teams had at least one player with more points than Nashville had. The Predators had the 24th-ranked power play and the 28th-ranked penalty kill, but their special teams didn't burn them badly. They also won less than 50 percent of their faceoffs, and it didn't seem to matter. Because Trotz knows how to win despite the stats. For instance, the Predators were the most disciplined team in the NHL with only 8.7 minutes of penalties per game. That's coaching. They were 6-2 in games decided in overtime and 8-4 in games decided in a shootout. That's also coaching. 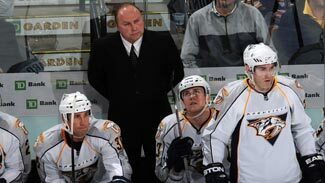 Trotz is one of the NHL's brightest coaching minds. It's time for him to have the hardware to show for it.